Featuring previously classified CIA and White House documents and exclusive interviews with Israeli, Palestinian, and Russian leaders, this best-selling author's first nonfiction work takes you on a suspense-filled journey---from biblical prophecy to today's headlines! Drawing on his Jewish heritage, Christian faith, and riveting reporting, Rosenberg reveals Scripture's reliability in predicting the future. Epicenter : Why The Current Rumblings In The Middle East Will Change Your F by Joel C Rosenberg was published by Tyndale House Publishers in September 2008 and is our 30091st best seller. The ISBN for Epicenter : Why The Current Rumblings In The Middle East Will Change Your F is 9781414311364. 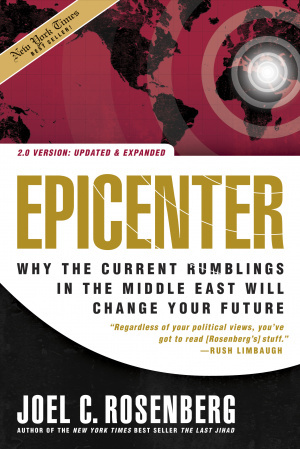 Be the first to review Epicenter : Why The Current Rumblings In The Middle East Will Change Your F! Got a question? No problem! Just click here to ask us about Epicenter : Why The Current Rumblings In The Middle East Will Change Your F.